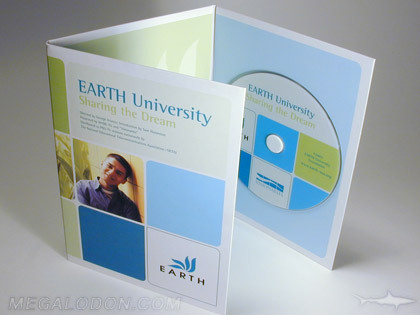 CD Replication Packages with 4C Printed Tall Recycled Content Jackets. Paper Stock options include our standard stock (20-30% recycled content) or our Truly Eco stock (70-80% recycled content), available uncoated or coated, and fiberboard stock (unbleached, end of chain pulp material). Disc holding options can include pockets of many styles (pinch pockets are the most popular on talll jackets! ), foam hubs, foam trays, and paper trays (made on 100% recycled paper, compressed, with cork hub). Look below for popular options for printed tall 4 panel and 6 panel CD jackets sleeves. We have dies for many different styles and customdie cut packaging is easy for us to make. Printing is full color on cardboard stock with your artwork. Jackets can have a variety of options such as extra pockets to hold 2 or more CD's, literature holders, business card holders, custom modified thumbholes, etc. And if you don't see the cd package you're looking for, please ask, these are just the most frequently asked for packages!